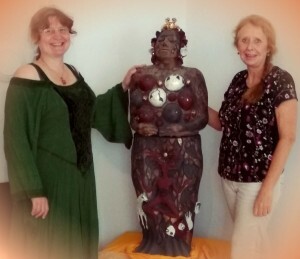 This Goddess-Sculpture (with antler 1,80m) I have made for the Goddess Temple in Glastonbury. From time immemorial Glastonbury, The magical Isle of Avalon, has been home to an ancient and powerful Goddess known as the Lady of Avalon. She is Nolava of the Sacred Land, Goddess of Compassion, Healing and Transformation. She appears in the myths and legends of this place in the Sisterhood of the Nine Morgens. 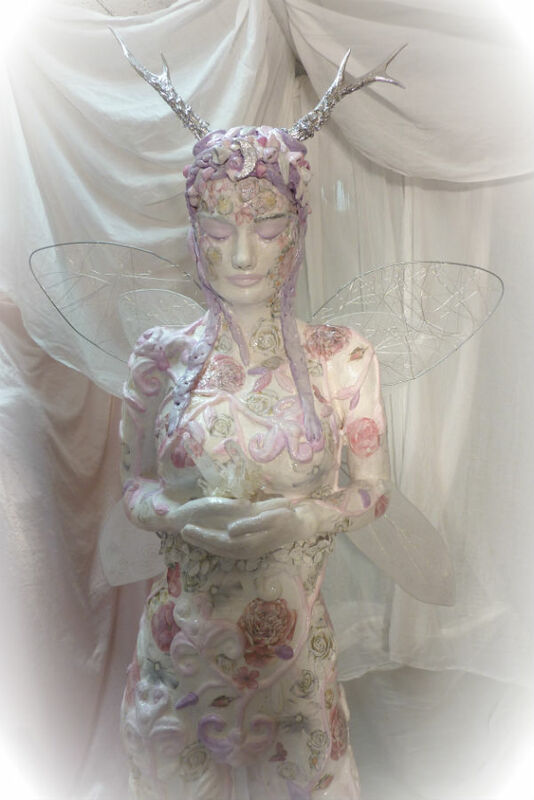 The most famous of whom was Morgen la Fey, the faerie half-sister to King Arthur. 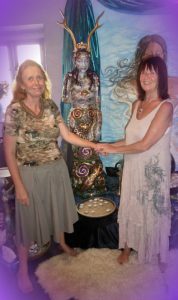 She is remembered as Maiden Bridie, Goddess of healing, poetry and smithcraft. She is the Great Mother Madron or Modron. She can be seen on misty mornings in the form of Rhiannon, the White Mare from the Seas. She is the Old Woman, the Crone of Avalon stirring Her Cauldron of Transformation of Creativity, Death and Rebirth.She is the Lady of the Lake Lady of the Holy Springs and Wells. “Above it will be light. Below it will be light. This ceramic sculpture is 180 cm high, constructed in three parts from clay. This 175cm big Sculpture I made for the “Tempio della Grande Dea” in Rome. 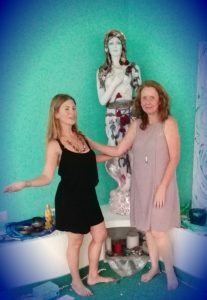 Aphrodite, die Göttin der Liebe, erhob sich nackt aus dem Schaume des Meeres und ritt auf einer Muschelschale zum Ufer der Insel Kythera und zog dann weiter zum Peleponnes.Endlich nahm sie ihren Wohnsitz zu Paphos auf Kypros. Gras und Blumen entsprangen dem Boden, wohin auch immer sie trat……..
Aphrodite(die Schaumgeborene) ist die gleiche weitherrschende Göttin, die sich aus dem Chaos erhob und auf dem Meere tanzte…..Mari, Moira(Moiren-die Schicksalsgöttinnen), Marina, Pelagia und Stella Maris, alles Titel, die sich auf ihre Herrschaft über das Meer bezogen. In Syrien und Palästina wurde sie als Ischtar oder Astarte verehrt. Häufig wurde sie auch mit Isis gleichgesetzt. Und sie war die göttliche Urahnin der Römer, die deren Gründer, Aeneas zur Welt brachte. 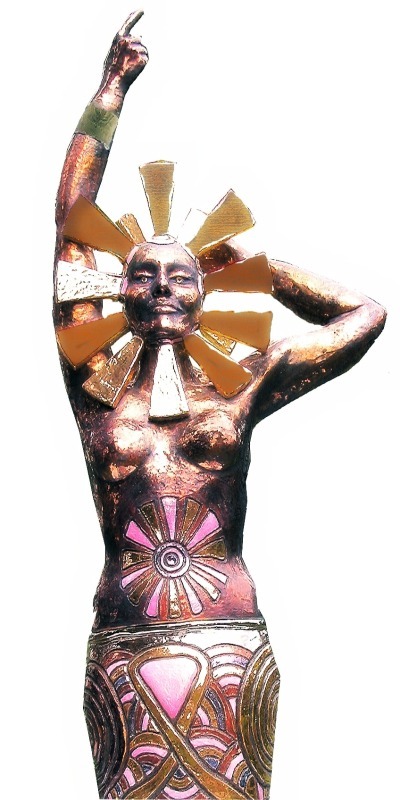 The Celts named their Sun Goddess SULIS, in Germania she was called SUNNA, and in Norway SOL. In Britain she was revered on Silbury Hill, the famous man-made mound within the Avebury megalithic site. Here she bore the eons from her big womb-barrow which is almost 40 metres high and has a diameter of more than 160 metres. In Austria, this sun form was the closest to Borbeth, one of three Bethen. This ceramic sculpture is 187 cm high, constructed in two parts from clay. It was fired three times. On the third occasion, a wide variety of lustres were burned, including a 24-carat gold and a platinum lustre. Aus Weiheinschriften der römischen Kaiserzeit bekannte vorrömische Göttin im Raum des heutigen Österreichs. Glantal und auf dem Ulrichsberg durch Inschriften bezeugt. gesamten Gebiet des heutigen Österreichs. Die Skulptur hat eine Höhe von 130 cm, beim 3. Brand wurde Goldlüster eingebrannt. The woman from the fairy-hills ….. her cry could bring death: “If the Banshee loves the ones she calls, then her song is a slow, gentle vocal which, although proclaiming the proximity of death, does so with tenderness which calms the dying and comforts the survivors. “Some people say that her cry is in fact the call of the diver “. The diver is a bird dedicated to the moon goddess, Luna. The German Fairies of the Water are similar to the Greek “Nereides”. The fishtail and headgear are partly composed of ceramic shells, burned in lustre. The other parts are moulded in glass. “Mother of the sea” the great fish borne by the gods…. The fishtail and the headdress partly consist of ceramic mussels into which lustres were burned. The other parts consist of a luxuriously worked glass mosaic made from blue and green opalescent glass. My goddess is decorated with flowers and a lot of gold spirals – an old symbol of rebirth. Her head is crowned by a crescent, a mark of all ancient goddesses, because it reflects the female cycle. I constructed this two-part, 135cm-tall ceramic sculpture by hollowing, then fired it three times. On the third firing I applied 24 carats of gold lustre. Cernunnos is the name of an old Celtic God. He wears a golden antler and represents the male in Nature. He is a guardian and defender of the forest, his animals and of all other beings, of course. I constructed this 95cm-tall ceramic sculpture by hollowing, fired it twice and glazed it. The myth of the Greek father of the gods, Zeus, who transformed himself into in a bull in order to kidnap the king’s daughter, Europa, is but one example of many male gods from ancient times who incarnated themselves as bulls. The Cretan cult of the bull is one example, with its king, Minos: A moon bull (the horns being reminiscent of lunar crescents) was sacrificed in his stead. The Egyptian redeemer Osiris was revered in the form of a bull as Apis Osiris, whilst Egypt’s moon bull was slaughtered annually by way forgiveness for the sins of the empire. Plinius reported that the Halcyon or kingfisher seldom appears and then too only for the winter and summer solstice time and during the downfall of the Pleiades. A most likely proof that he was originally a manifestation of the moon goddess, who was honored at both the solstice times alternatively as goddess of the life and the death. 61 cm height ceramic figure constructed in a concave manner, which was burnt to a 24-carat gold glimmer effect by the third round of burning. Wingspan: 85 cm, I have produced (one) with Tiffany work. Opalescent glass was used there. was my blood,was my body. die den Göttern das ewige Leben verlieh. Die 75cm hohl aufgebaute Keramikskulptur ist zweimal gebrannt und mit einem Glasmosaik bearbeitet. Blancheflur, “White flower”, the lily-girl of the Celtic Initiation rite, which showed the virginal aspect of the great Goddess. 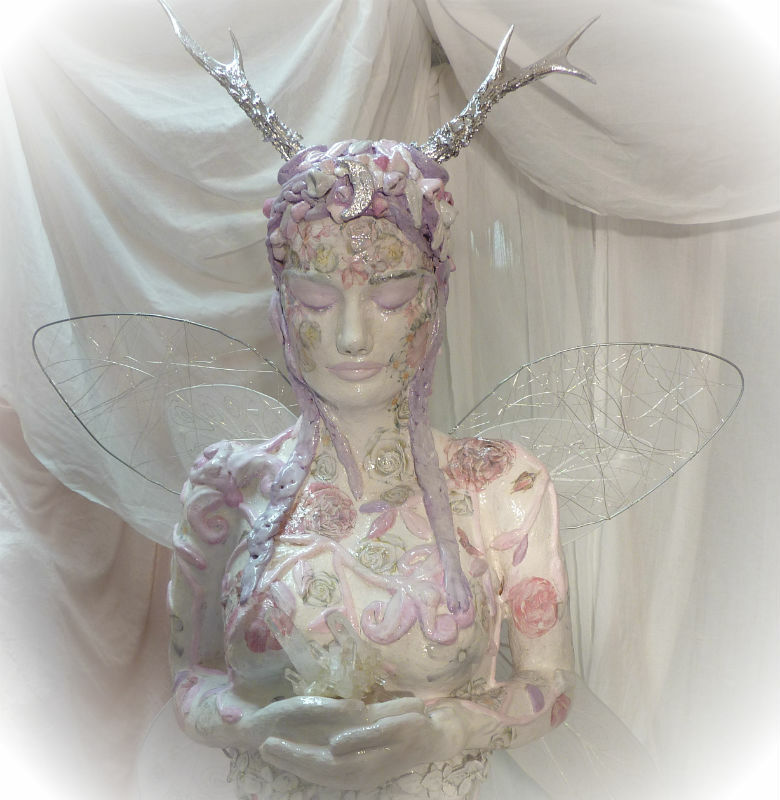 The Celtic narratives say that Blancheflur Holy Fool has received in Faerie. Before it was converted to Catholic purgation by the erudite monk. Ceramic sculpture was constructed in a concave manner. H:60 cm, Burnt thrice and seen with glimmer effect. Wingspan: 90 cm, the fabric skin of the wings consists of silver-plated wires and various white pearls. 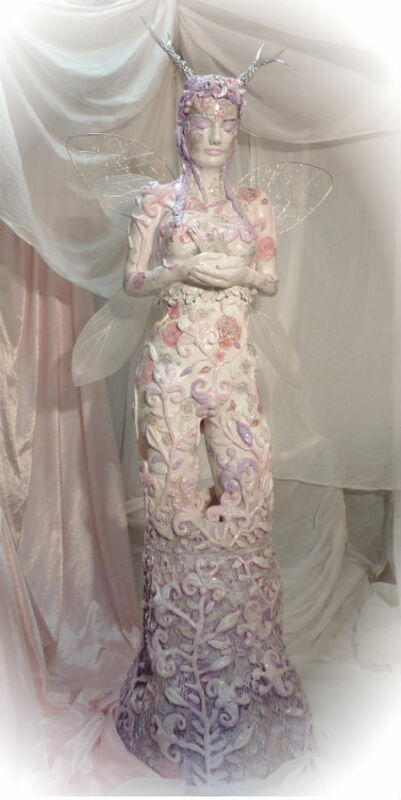 The 75 cm ceramic sculpture shows a while fairy-like figure, which appears to rise to a tree but it enrooted with it. It is the soul, guardian and vigor of this tree, which crops many crystal fruits and shines with all glittering colours. The ceramic was constructed by me in a concave manner, burnt thrice with iris glitter effect. Then I applied Opalescent glass plates, in colours iridescent pink and blue. The fruits consist of honed crystal glass. 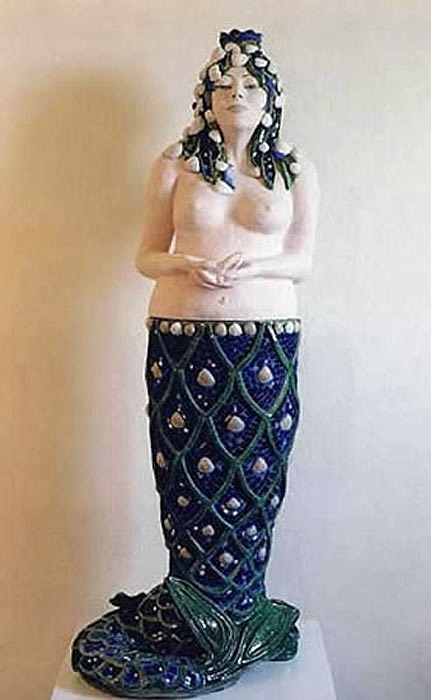 Nereide is the Greek term for mermaid. They could grow their figures and can appear sometimes as beautiful women and then again as animal-like figures. 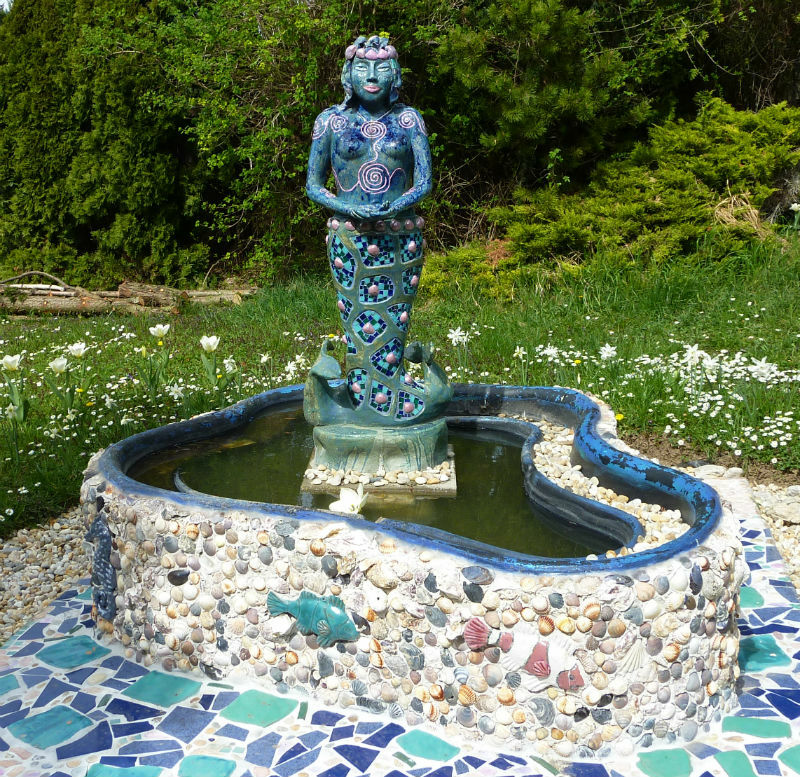 My mermaid was made of clay in a concave manner, burnt thrice and is seen with a bluish green mosaic of Opalescent glass. I have used iris glitter effect during the third burning. There lived the feminine spirits of light in Paradise Alfaheimr (Land of elves or fairies), who created the sun. Just like their elder sisters Dakinis, the elves, Valkyries or fairies can be gorgeous as well as nasty and thus incarnate the birth and the life on one side and the death on the other side. The concave sculpture of clay created by me is 66 cm high. I achieved the terra effect with the 2nd burning. With the third burning, 24-carat gold glitter effect was burnt. 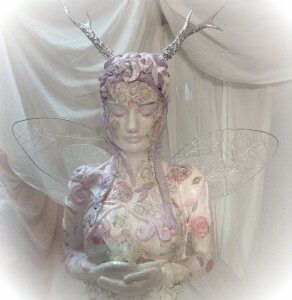 The wings of the elf are worked with Tiffany technique, the Opalescent glass was used there. Ovids Name for the goddess DIANA. The original Titania mastered the Pantheon of Aegean “Titans, the elder gods, who were subverted later by the Olympians under father Zeus. The concave sculpture is 41 cm high, was burnt thrice. I have burnt the 24-carat glitter effect during third burning. The wings are done in Tiffany technique. The lion was often the symbol of the sun god in Greece and Rome. However it is associated usually with the goddess in Middle East and Egypt. My lion is 43 cm high and 39 cm long. The ceramic figure was constructed in a concave manner and acquired the 24-carat gold glitter effect during third burning. “Morgenröte”, Romen name for Eos uad Mater Matuta , the morning mother of the sun. 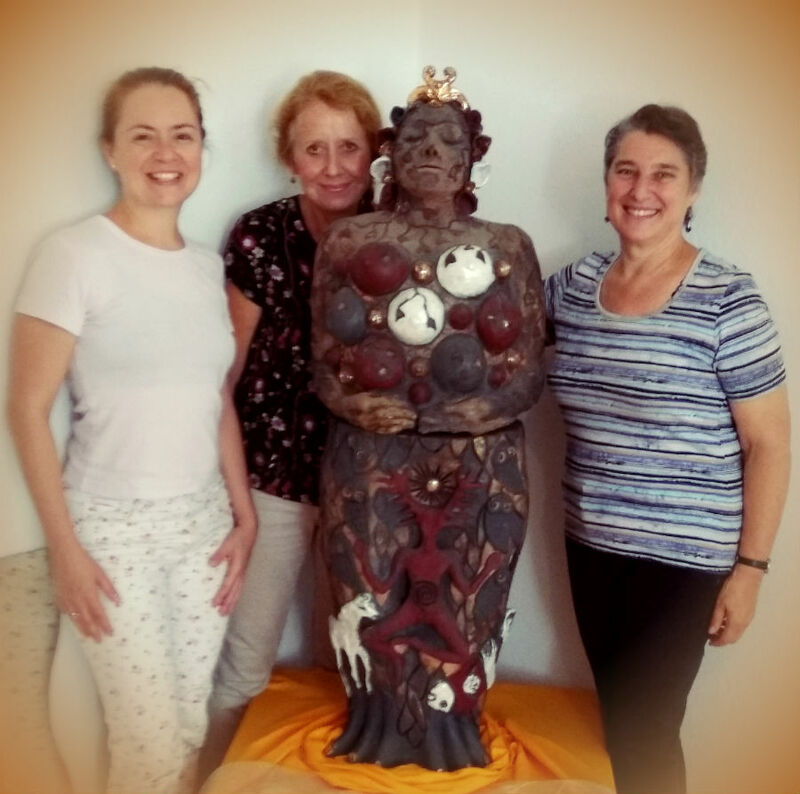 55cm high concave ceramic figure – burnt thrice. My depiction of the Maria as “black young dame”. 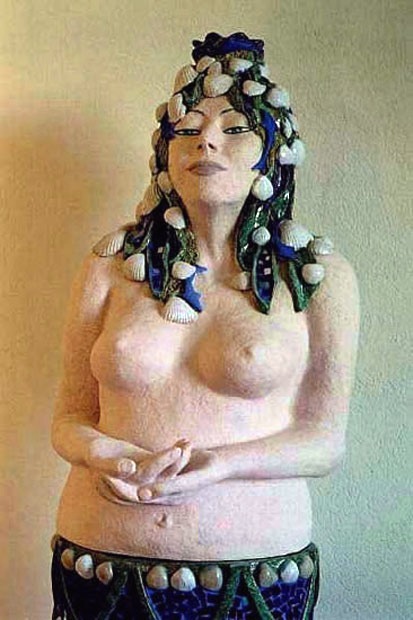 The figure is concavely constructed and is 55 cm high. It was burnt thrice. The 24-carat gold glitter effect was acquired during third burning. It is said that the mother of night gave birth to the Orphists, first the cosmic egg, which was equated with the moon. And then she created sky and earth from the halves of the egg shells. I constructed this 53 cm high ceramic sculpture in a concave manner and burnt it twice. The nest was shaped with silver-plated wires. A large goose egg is arranged in the nest. The owl was considered as sacred amongst Greeks of Athena; (it is) figured as Mesopotamian “goddess of vision”, whose gazing owl-eyed figures were found all over Middle East. The 50 cm high ceramic was constructed in a concave manner and burnt twice. This container is 35 cm high; I constructed it manually in a concave manner and burnt it in an earth hole (furnace in an earth hole). Then I burnt it once again in the ceramic oven to get a 24-carat gold glitter effect. It depicts a face, which opens backwards in the skull and releases a smoke-blackened deepening (for fumigating). Homer’s “rose-fingered morning-red sky” was Eos. The pink clouds in the sunrise were commonly distinguished as incarnations of its pink fingers. As goddess of birth, she complies with the (sun) rise. 52 cm high ceramic, burnt twice.